I have seen these two words used interchangeably, and although they basically serve the same purpose (keeping the rain off of your head), they are not the same. Parkas are jackets with a hood. They are normally wind proof and/or water-repellent. They tend to look like over shirts, and the most popular color to have these days is a military inspired color, be it olive green, khaki or straight up camo. Anoraks are a hooded pullover jacket made of any weather resistant material. I have a “vintage,” (I use the term pretty loosely) anorak from Old Navy from the early 90’s. Haha! What? I said I used vintage loosely! ;). I tend to wear lightweight parkas as my transitional jacket during Spring & Fall. I can layer it over a vest, with a scarf, if necessary, for those colder days, or wear it by itself on a cool day. My anorak, on the other hand, travels in my bag all summer long. Its design allows it to fold into a pouch for easy storage. So when the rain starts to pour on a hot summer day, I can dip into my bag and pull out my anorak pack for protection. 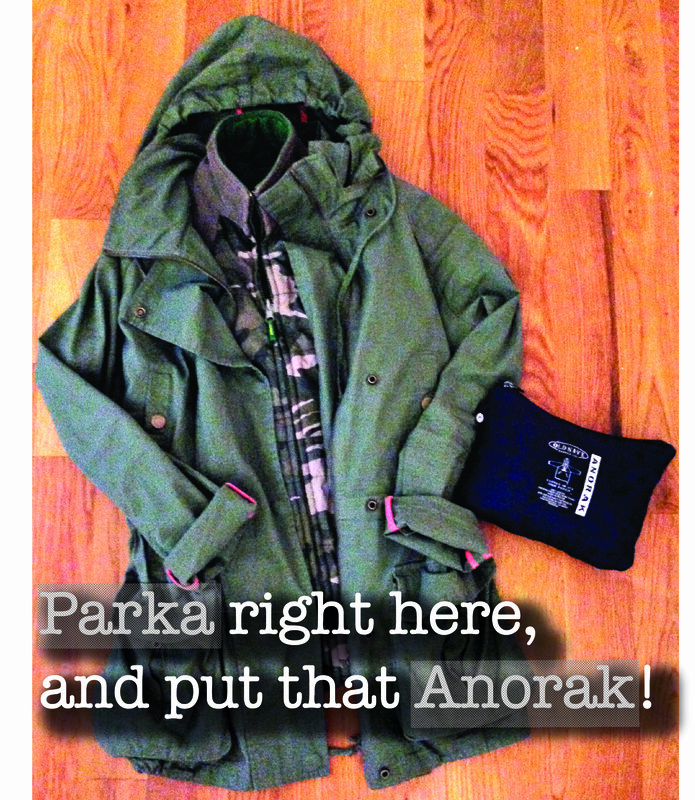 Check out the outfit below to see how to wear your parka this Spring, and mark this one off of your list. When those April showers start to fall, I love throwing on my lightweight parka with a comfy outfit underneath. 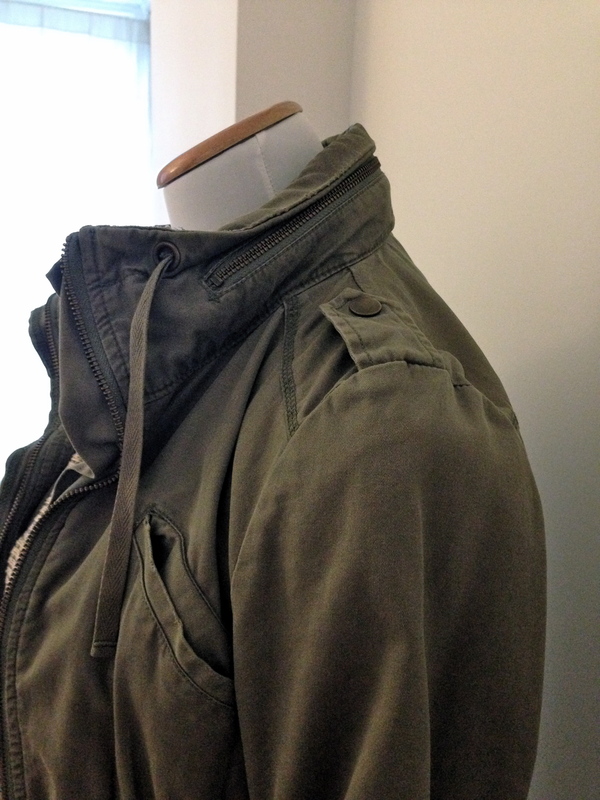 This Parka has military inspired epaulets and a zippered collar with a hidden hood. I love this collar detail because when you don’t need the hood you can store it away in the collar and look really sharp with your high constructed collar. A quick peek at the outfit: On rainy days…let me keep it real, on MOST days, I like to be snuggly, so I have invested in a lot of these shawl collar or cocoon-like cardigans. This marled, oatmeal color cardigan has specs of grey and white, so I incorporated those colors in the rest of the pieces. 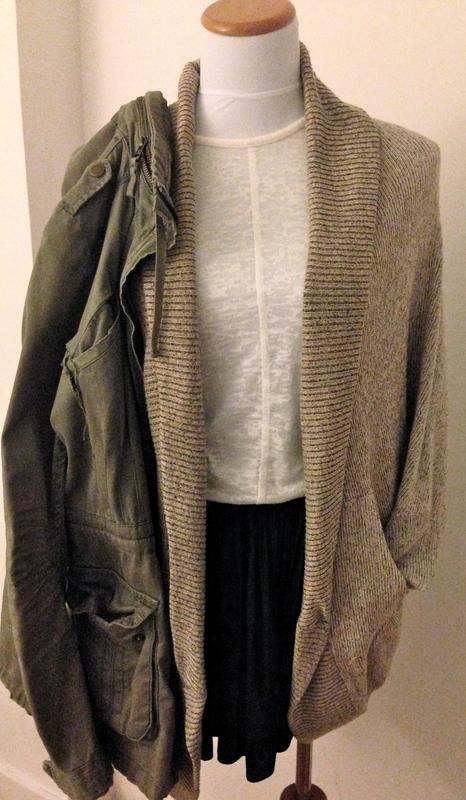 I used a white 3/4 sleeve burnout top and charcoal grey pleated culotte shorts to bring the outfit all together. If it’s cold out, add some tights or leggings to the mix. 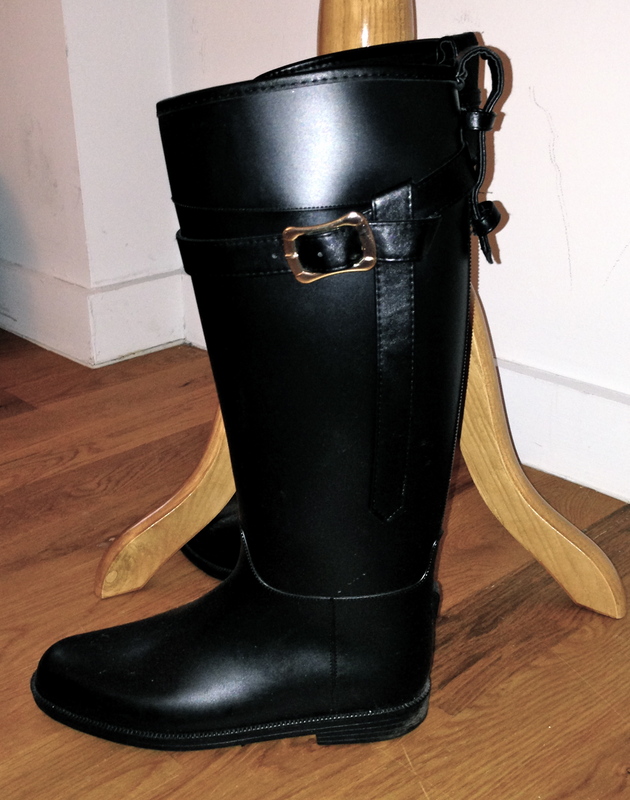 This entry was posted in Fashion List and tagged BCBG Max Azria, Century21, H&M, Old Navy, Rainboots, rainy days, Urban Outfitters, Zara. Bookmark the permalink. ← Why you sweatin’ it? Thanks for the accolades. It’s not really that hard to do, but it does take time. My blog has a lot of visuals and I spend time on the text, but if it had just a main pic and then just written content it probably would take less time for me. If you commit to it, it will be easy. Good luck!